New listingMAHOGANY OR WALNUT GLASS DISPLAY CABINET, SIDEBOARD DRESSER. BEAUTIFUL ANTIQUE. JAYCEE/OLD CHARM? (NO MAKERS LABEL) THERE IS '35' STAMPED ON BACK OF EACH DRAWER AND DRAWERS ARE NUMBERED 1, 2 AND 3. TUDOR/GOTHIC STYLE SOLID OAK CABINET LAMP BEDSIDE TABLE/POT CUPBOARD/DRAWERS WITH ORNATE DETAILING, HINGES AND HANDLES. THERE IS SOME WEAR AND A SCRATCH TO THE TOP COMMENSURATE WITH AGE AS SEEN IN PHOTOS. A MUCH LOVED PIECE. FROM A SMOKE AND PET FREE HOME. VERY STURDY AND HEAVY. MANY USES. CASH ON COLLECTION ONLY PLEASE FROM BD16 WEST YORKSHIRE. NOPAYPAL. Lovely Rustic Display Shelves Cabinet with a great distressed look. One section of glass is missing from one side but could easily be replaced. Approx size H66.5cm x W61cm x D31cm All my items are antique, vintage or previously loved so do have signs of use and wear. Viewing is welcome but by appointment only. This is a collection only item from Milton Keynes. Collection must be made within 7 days of the auction finishing and cash on collection is preferred. Please take a look at my other items. 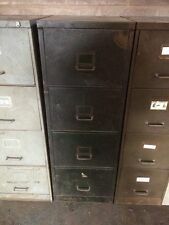 Antique Filing Cabinet. 3 lower drawers 24cm height. SBI Centre. 130cm Height. 55cm bottom two Drawers. Salvaged pine corner cabinet. Beading to the top is loose, one joint in the door frame is loose and requires attention, modern door magnet has been added and lock is not original. It measures about 80 cm wide x 45.5 cm deep x 98 cm tall and requires 53.5 cm of wall space measured from the corner. Cash on collection only please (within seven days) from Cheltenham, GL52. Very sturdy pair of cabinets perfect for the right interior. A lovely antique pine cabinet. Would grace any room or interior. 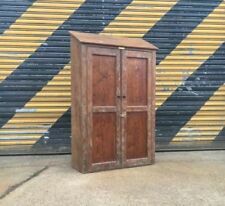 Antique small French pine dresser / larder cupboard. Pierced brass gallery around the top and brass handles on the drawers and doors. Dovetailed drawers. 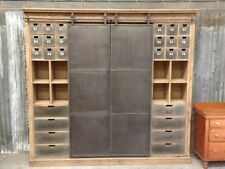 ☆ 1950s Original School Locker Unit with 12 individual wooden cupboards with inlaid handle. Ideal for a studio or garden office room. These are very rustic. There are 8 lockers with doors in not too bad condition and 4 without. Beautiful mahogany glass cabinet with stunning legs/ stand. Three wood shelf’s ,Top corniest. size is approx .45in wide 15in deep height is 6ft &1/2in. Cabinet can be separated from base. Old mahogany cabinet but in excellent condition,all glass is perfect . Please view photographs as they form part of the description.Please note the content s of the cabinet are not in this sale.Any questions please ask. VINTAGE INDUSTRIAL TV CABINET COFFEE TABLE TV STAND RECORD CABINET. THIS IS A NEW ITEM MADE FROM RECLAIMED MATERIAL. Antique Filing Cabinet. SBI Centre. Antique tambour. 36.5cm deep. 39.5cm wide. The shelves can be removed easily and moved up and down and you could easily add more if needed. Antique Pine Lockers. Amazing antique pine Lockers that would look great in a large hallway or utility for shoes and other bits and bobs. SBI Centre. 62.5cm wide. 261.5cm length. 68.5cm Height. A fabulous mid 20th century painted Housekeepers cupboard, painted in a green ground with heavily distressed finish, the corniced top over two panelled doors with double shelves within, raised on a plinth base. The cupboard is of good proportion, quite tall and narrow. Overall a super looking cupboard. The interior has five nicely shaped file shelves. A well made little piece with a single panelled door. There are a few small marks here and there ( see photos ) but nothing major and nothing you wouldn't expect on a piece of this age. HAND MADE SINGLE DOOR RUSTIC CUPBOARDS READY TO FINISH/ POLISH / SAND ETC. THESE ARE HAND CRAFTED SO EVERY PIECE IS UNIQUE THESE WOULD NORMALLY BE £125 EACH. TRADE SALE £75 EACH ONE. WILL ADD PICTURES OF THE 3 THAT ARE AVAILABLE. VICTORIAN PINE GRADUATED SHELF. EITHER FLOOR OR WALL MOUNTING. TOP SHELF HAS A GALLERY BACK. THE BASE HAS 4 SLIM PAD FEET. DRAWER INSIDES ARE CLEAN AND READY TO USE. CONSTRUCTED FROM SOLID PINE AND DOVE TAILED. CHEST IS IN A SOLID AND STURDY CONDITION WITH RUSTIC CHARACTER. The cabinet is located near Beauly in the Highlands and can be viewed and collected from here. Nice simple clean lined piece which is just stunning really ! The cost for this would be £65. Due to the size and weight it would arrive wrapped and on a pallet. Good pre owned antique condition with marking to the top and wear in line with its age. The catch will need tightening and there is a loss of varnish underneath the handle. Continental Pine Cupbaord. Large pine Continental cupboard, the top section with pair of doors with decorative moulding & spiral columns, single internal shelf. The base section has a pair of short drawers with cupboard below on small bun feet. MAKERS LABEL READS OWEN & RANDALL, STOR CABINETS LTD, MAIDENHEAD, ENGLAND. DRAWER INSIDES ARE CLEAN AND READY TO USE. CHEST IS IN A SOLID AND STURDY CONDITION WITH SHABBY / RUSTIC CHARACTER. ORIGINAL WORKING LOCK AND KEY, WHICH LOCKS ALL 10 DRAWERS. DRAWER INSIDES ARE CLEAN AND READY TO USE. CHEST IS IN A SOLID AND STURDY CONDITION WITH SHABBY / RUSTIC CHARACTER. We hope we have given sufficient information so that a balanced decision can be reached. A useable and stylish presentable unit. ANTIQUE 4 DRAWER MAP / PLAN CHEST / CABINET c1910's. THE DRAWER BASES AND CABINET BACK HAVE BEEN REPLACED TO A GOOD STANDARD. CHEST IS IN A SOLID AND STURDY CONDITION WITH SHABBY / RUSTIC CHARACTER. DRAWER INSIDES ARE CLEAN AND READY TO USE. The 40 drawers have matching turned hardwood pull handles and the drawers are simple sit-in type. Great fit to any eclectic or chabby chic interior. Very solid build. Would actually make a fantastic unit for a crafter, jewellery maker etc as all those little things can be hidden away in an interesting yet organised way. PICK UP ONLY SIDCUP KENT. SIZE APPROX OF LARGEST 12 3/4" H X 11" W X16 D.
A lovely continental rustic pine spice cabinet profusely carved on the front and left hand side but plain on the right hand side - can be either wall hanging or free standing (there are wall fixings on the back). Three handy storage shelves plus the bottom section. The cupboard sits on bun feet and has has a working lock and key. There are signs of historic wood worm and we have also tewated this as a precaution. 2 rustic white = the unit is painted white then sanded back and waxed to give it a fantastic rustic shabby chic look. 1 Wax brown = we hand wax the wood which gives it a stunning rich rustic brown finish. The cupboard is of good proportion, quite tall and narrow. Overall a super looking cupboard. A well made little piece with a single door. There are a few small marks here and there ( see photos ) but nothing major and nothing you wouldn't expect on a piece of this age. Lovely rustic corner cabinet with glazed and leaded window on upper doors. 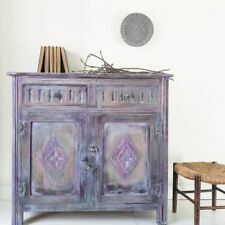 Hand painted in Winter Grey, then silver waxed to protect and enhance the sheen, resulting in a unique and individual piece with shabby chic effect. Mid century old factory lockers. Show lots of age related wear and patina. Please refer to the pictures. Measure approx Height 170cm Width 60cm Depth 40.5cm Listed as collection from Tynemouth ne30. If nationwide / worldwide delivery is needed, please contact us. Charming small wooden wall cupboard with drill holes. Rustic arts and crafts vibe. Max height 41 cm x Width 32.5 cm x 14 cm Depth. Structurally sound. Several old woodworm holes on back. THE CABINET STANDS ON FOUR SQUARE LEGS. THE CABINET HAS DOUBLE DOORS WITH SINGLE PANELS, INSIDE HAS 3 REMOVABLE SHELVES. Satin birch fall front revealing fifteen drawers. Heavy solid item which will grace any room and add a real touch of class. Item is a collection only from Neasden in London NW10. THE CABINET IS PART OF THE HAND-MADE 'GEORGIAN / REGENCY PERIOD' RANGE, MODEL No. THE CABINET ALSO TAKES ON A DELIBERATE STRESSED, AGED APPEARANCE AND HAS VISIBLE RUSTIC 'STRESS' MARKS THROUGH-OUT. IT IS MADE IN THE TRADITIONAL 'GEORGIAN STYLE', USING ONLY THE VERY BEST QUALITY TIMBER, VENEERS AND FINISHES AVAILABLE.